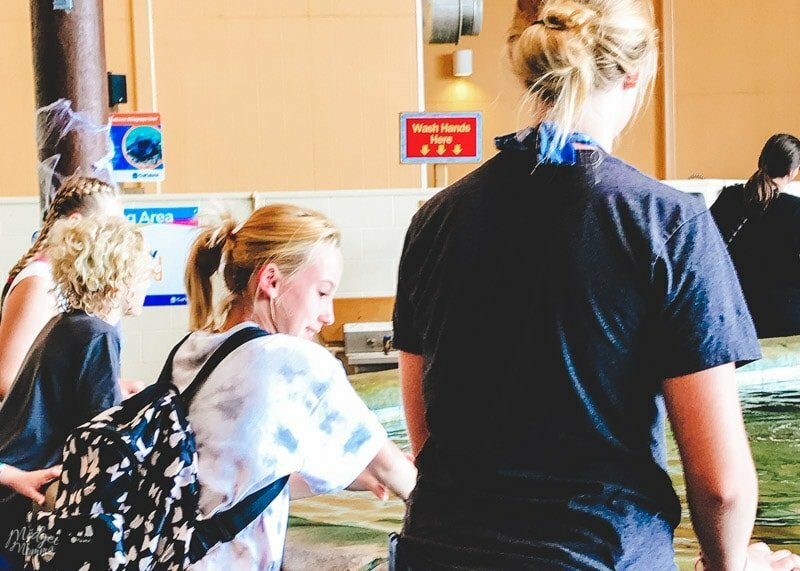 Our visit to Gulf World Marine Park in Panama City Beach Florida was absolutely amazing and is the perfect hands on learning and fun place to visit when you are in Panama City Beach Florida! 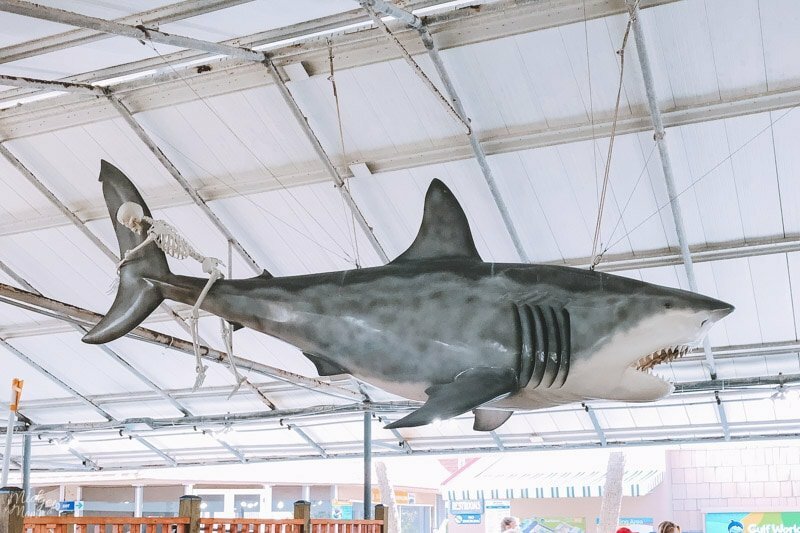 If you are looking for an amazing, fun and educational place to spend the day with your family, Gulf World Marine Park can easily fill up a whole day of fun! 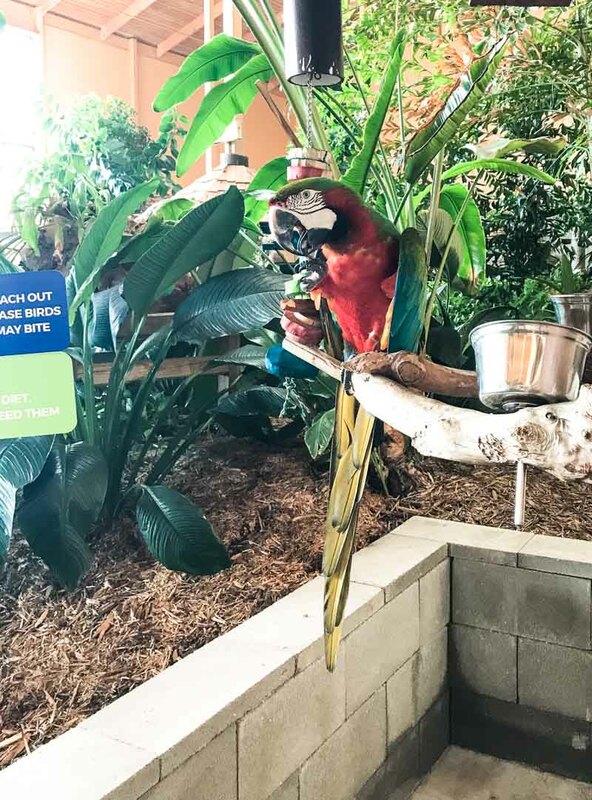 Gulf World Marine Park is home to a large variety of spices including bottlenose dolphins, California sea lions, harbor seals, penguins, tropical birds, stingrays, and African penguins there is a lot of learning and fun to be had with a visit! All of the animals at Gulf World are rescued and deemed non releasable, donated by a former owner or born in human care and this is their home. On top of that Gulf World Marine Park is part of Gulf World Marine Institute and is dedicated to leading, assisting and managing the recovery and rehabilitation of stranded, sick or injured marine mammals or sea turtles! They serve as an environmental educational tool for the local and national community to help teach about the importance and caring for sea life. I personally love places that are not only fun for us to visit, but also are making a positive change in the world. 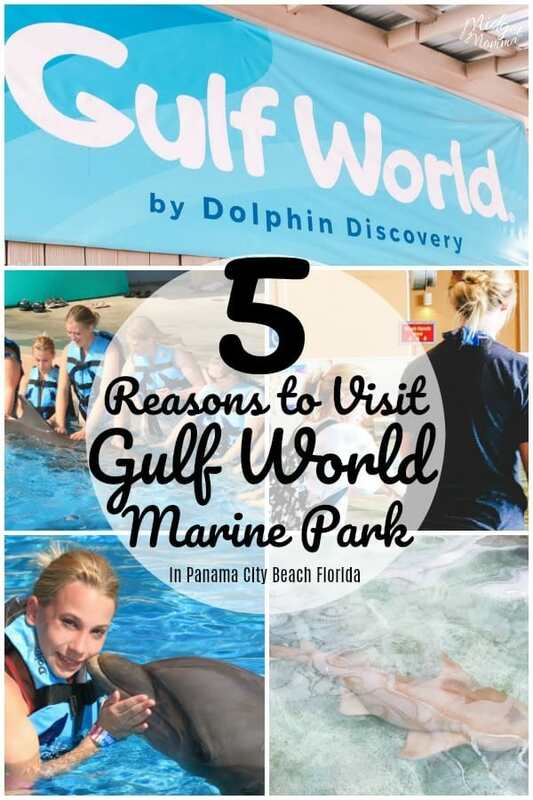 While there are many more then 5 reasons to make a visit to Gulf World Marine Park in Panama City Beach Florida, there are the best 5 reasons in our book! 1. Animal Exhibits at Gulf World Marine Park. There are so many different animal exhibits to check out and see at Gulf World! We unfortunately did not get to see all of the different animal exhibits while we were there but the ones we did get to see were amazing! 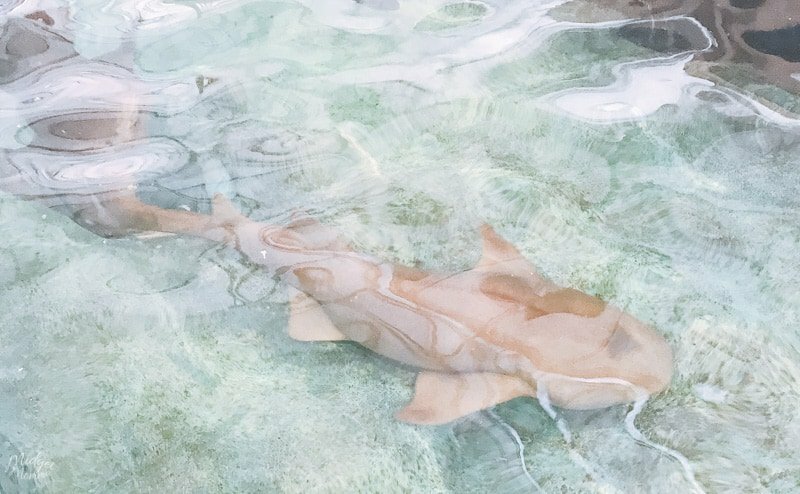 From birds, to stingrays, fish, sharks and more there are lots of animal exhibits to explore! While you are visiting Gulf World Marine Park you will get to see many of the animals that live there. Including bottlenose dolphins, California sea lions, harbor seals, penguins, tropical birds, stingrays, and African penguins and more! Seriously, I could have spent all day walking around just looking and watching the animals. There are six different educational shows daily at Gulf World. Each show is filled with information about different animals! You can see the all, or just pick the ones that interest you the most! For some of these shows you will even get a hands on experience of getting to touch and feed them! There are 3 different dolphin experiences that you can enjoy when you make a visit to Gulf World Marine Park! McKenzie and I did the Dolphin encounter and it was AMAZING! It was so much fun to be up close and personal with a dolphin and then getting to get dolphin kisses, a hug and a dolphin handshake! It was totally AMAZING! I highly recommend it for anyone making a trip to Gulf World Marine Park both kids and adults! 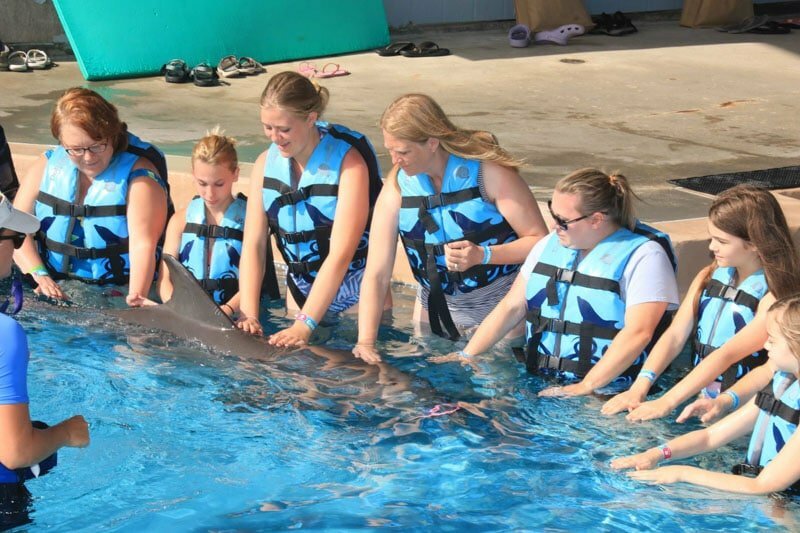 Dolphin Encounter: This program is designed for all ages to have a great learning experience and meeting; to know more about the wonderful dolphins by interacting with them. Everyone who hangs out with the dolphins in this experience will get to watch the dolphins up close do tricks, along with get a hug, kiss and handshake from a dolphin! 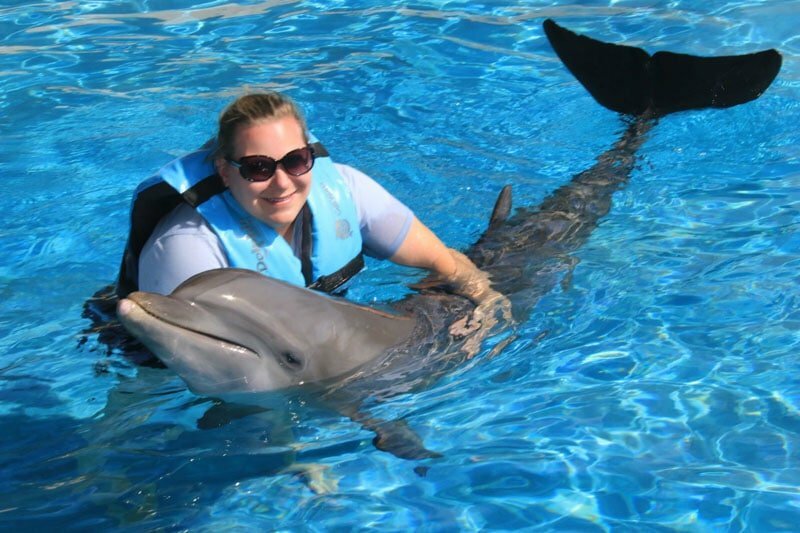 Swim Adventure: With this swim with dolphins experience you will get to go on a fast and exciting ride with the dolphin while you hold onto their pectoral fins! Plus you will get a will get to watch the dolphins up close do tricks, along with get a hug, kiss and handshake from a dolphin! Royal Swim: This swim with dolphins experience will give you the most hands on action with a dolphin! You will get to feel the thrill of the foot—push. The dolphins will rise you above the water surface by pushing you from the soles of your feet! Plus you will get to go on a fun ride, with a Dorsal tow! And you will get to watch the dolphins up close do tricks, along with get a hug, kiss and handshake from a dolphin! 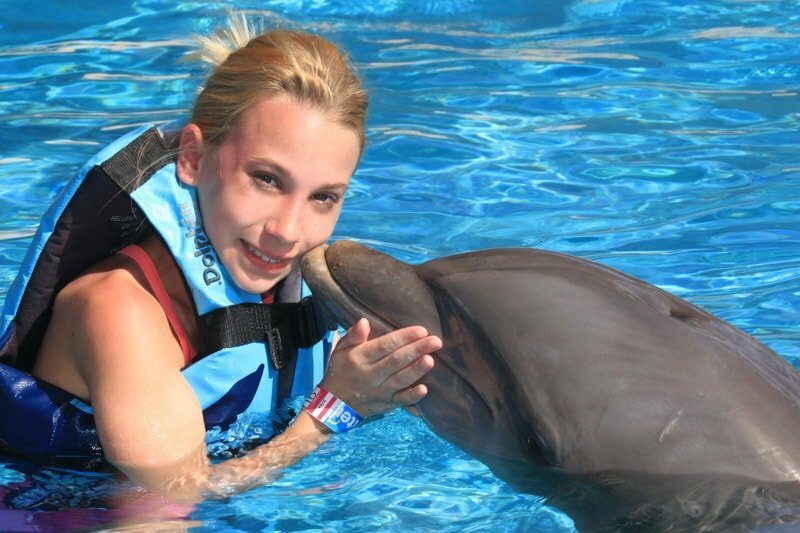 Get all the information about swimming with dolphins at Gulf World here. There are nine different interactive programs that you can take part in to make your trip to Gulf World Marine Park even more amazing! From getting up close and personal with a Harbor Seal to snorkeling with stingrays to hands on learning about the Endangered African penguin from animal care specialists and more there is definitely an interactive program for everyone who is with you to enjoy! If you are wanting to make a full day of interactive programs you can by picking the VIP Sea life experience where you will get to enjoy 3 programs of your choice and interact with three different species, plus lunch and photos on top of enjoying the shows and exhibits! 5. Perfect for the whole family! Gulf World Marine Park is a place the whole family can enjoy, no matter how old the kids are! If you are looking for something that will make the whole family have fun, this is one place I can’t recommend enough! McKenzie and I did not get to see everything while we were there for our dolphin encounter but it is totally on the wishlist of things for us to do as a family. McKenzie even said how much fun her siblings would have if they came too! If you are a homeschool family, this is a great opportunity to get some hands on science, and some amazing learning in for the kids without them even realizing that they are learning! 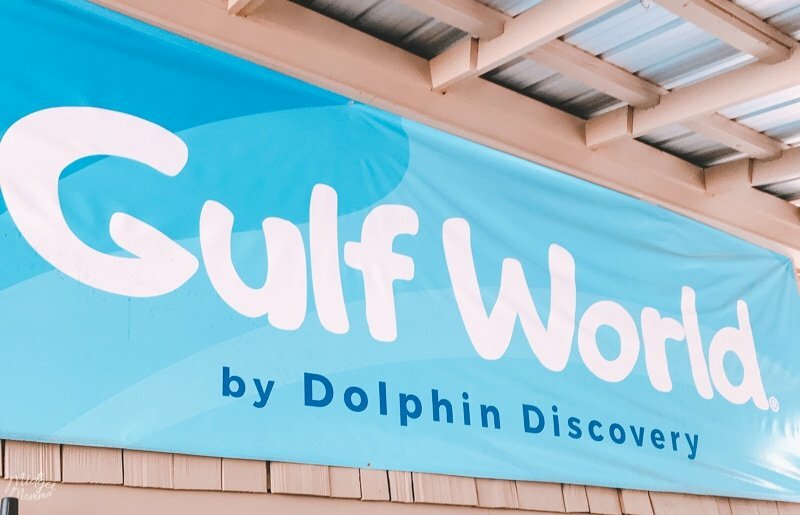 To plan your trip to Gulf World Marine Park, head on over here for all information on admission, location and more!